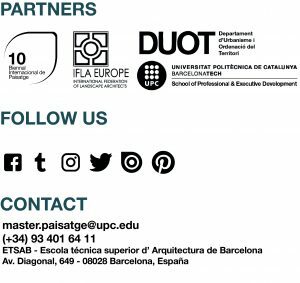 Imma Jansana – Master in Landscape Architecture Barcelona – Universitat Politècnica de Catalunya – 35ª EDITION. Architect by the School of Architecture of Barcelona in 1977. Between 1989 and 2001 she was an architect responsible for urban projects in the City Council of Prat de Llobregat (Barcelona). She has been a professor of the ETSAB landscape master’s degree and of the landscape specialty of the School of Architecture of the University of Navarra in the 2007-2008 academic year; Professor at the Corso di laurea specialistica in Architettura per il Paesaggio at the Scuola di Archittetura della IUAV di Venezia between 2006 and 2011; Teacher of the landscape master of the ETSAB of Barcelona between 2008 and 2010; Professor of city and landscape workshop II at the School of Architecture of the University of Navarra in the 2014-2015 academic year; Director of the Montevideo Seminar, School of Architecture of Uruguay. In addition to being a guest professor at numerous universities. In 2006 he founded the company dedicated to architecture and landscape JANSANA, DE LA VILLA, DE PAAUW, arquitectes, SL. with the architects Conchita de la Villa and Robert de Paauw. He has received numerous awards and recognitions for his work, especially two FAD AWARDS for the Gavà Maritime Walk and the Mirador in the marshes of the Llobregat Delta and the 2012 EUROPEAN PUBLIC SPACE PRIZE for the restoration of the anti-aircraft batteries of the Turo de la Rovira in Barcelona.